SUNY New Paltz will award an honorary doctorate of humane letters (L.H.D.) degree to Bre Pettis, co-founder and former CEO of MakerBot, a Brooklyn, N.Y. – based global leader in desktop 3D printing and scanning. The degree will be awarded during the Undergraduate Commencement Ceremony on Sunday, May 17. Pettis will deliver the undergraduate commencement address after receiving the honorary degree, the highest honor that the State University of New York can bestow upon an individual. The degree is approved by the SUNY Board of Trustees. Pettis is well known as one of the “most influential minds in technology,” “a rock star among makers,” and a “leader of the DIY movement,” due to his accomplishments at MakerBot and strong public advocacy for the value of personal manufacturing. As a dynamic, engaging, and well-respected leader in his field, Pettis helped propel SUNY New Paltz to the forefront of excellence in 3D printing technology when SUNY New Paltz and MakerBot launched the nation’s first MakerBot Innovation Center at the College. This historic public-private partnership builds upon the College’s initiative to become the premier hub for 3D printing and advanced manufacturing in New York, and provides students and faculty, and local business and industry access to and education about this burgeoning do-it-yourself technology. Pettis, raised in Ithaca, N.Y., began his career as an art teacher for seven years in the Seattle public school system following college at The Evergreen State College, Olympia, W.A., where he studied mythology, psychology, and performing arts. He has always had a desire to make things and drew immense pleasure from showing his students the power of creation. He started a venture producing how-to videos and posting them online to connect with students. This led to his role at Make_magazine as a host for its popular “Weekend Projects” video podcasts, teaching millions of viewers to make a wide range of creations from workbenches to leaf-blower-powered hovercrafts. In 2008, he co-founded NYCResistor, a collective where groups of like-minded individuals could redo software and machines to their liking. This was the testing site for MakerBot technology. By 2009, Pettis and two partners were refining the technology and building their first MakerBot 3D printer. MakerBot 3D printers make an object using “additive” technology, building layer-by-layer from the bottom up. 3D printers have been around for close to 30 years, but Pettis created a desktop version accessible in both use and price for the average consumer market. The result is a tool that can fulfill a number of practical purposes and print items from jigs and fixtures, machine and product prototypes, all the way to dollhouse furniture and board game pieces, cell phone cases, and various molds and models for business and personal use. Today, MakerBot has grown to more than 600+ employees, sold more than 80,000 3D printers, and is a subsidiary of Stratasys – a long-established leader in industrial 3D printing. Currently Pettis is the chief innovation officer for Bold Machines – The Innovation Workshop at Stratasys. Stratasys purchased MakerBot in June 2013 and Pettis started the Bold Machines initiative in September 2014. At Bold Machines he is pursuing new innovations to test the full capability of 3D printing technology. 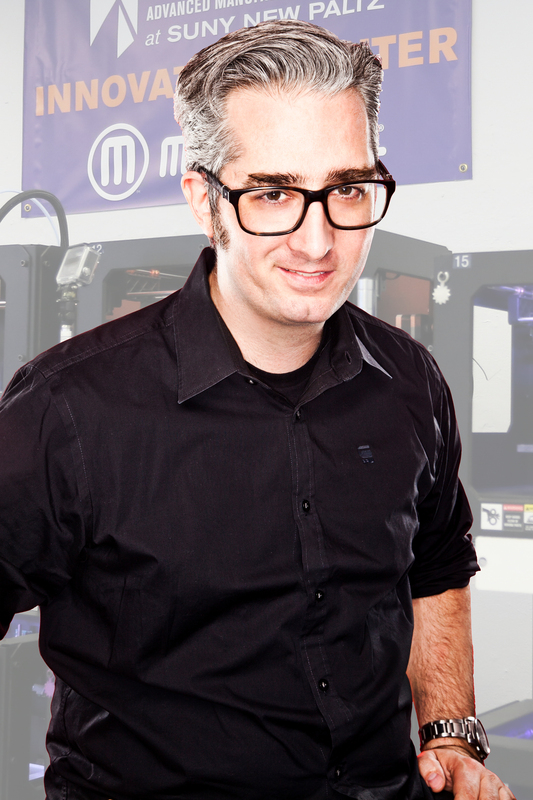 He continues to influence the long-term strategic direction of MakerBot as a member of the board of directors. Since launching the HVAMC in spring 2013, the College’s effort to fuse learning and manufacturing, science and the arts has continued to gain momentum. In February 2014, the College partnered with Brooklyn, N.Y. – based MakerBot, the leading manufacturer of desktop 3D printers, to open the nation’s first MakerBot Innovation Center at SUNY New Paltz. The 3D Printing Initiative received additional funding in fall 2014, including a $10 million NYSUNY 2020 Challenge Grant to help establish an Engineering Innovation Hub and $850,000 in capital funding for a new 3D printing laboratory. In December 2013, the Mid-Hudson Regional Economic Development Council and Governor Andrew Cuomo awarded the College $1M in state economic development funds. Currently, the HVAMC is providing digital design and fabrication expertise to about 60 businesses and entrepreneurs throughout the region. The Center also engages the local community and educates the public about the possibilities of 3D printing. Workshops and courses for K-12 educators, including through the Governor’s New York State Master Teachers Program, have attracted a wide variety of teachers, from art to science, who have an interest in digital design and fabrication and are utilizing these new technologies in their classrooms.